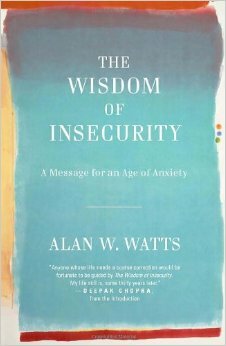 I’ve been feeling a bit anxious and insecure recently, so a writer friend, Dominica Phetteplace, recommended that I read Alan Watts’ The Wisdom Of Insecurity. And, unlike every single other time someone has recommended that I read a work of pop philosophy, I actually went ahead and did it, and I found it to be really helpful. I don’t know, maybe Watts is some kind of genius and is really able to make me see the world in a new light. Or maybe it just brought to my attention some things that I was finally ready to start thinking about. Probably a little of both. The book is about how human beings are constantly haunted by the idea that things could go wrong. That even in the moments when we’re most happy (especially in those moments?) we think about the ways that our happiness could be taken away from us. But anxiety over losing something isn’t the bad thing necessarily. Or, rather, it’s not the worst thing. Rather, the real destroyer of happiness are the things that we do in order to alleviate that anxiety. Because each time we think about losing our happiness, the idea is so repulsive that we instinctively move towards familiar sources of comfort: we pursue cheap pleasures or we convince ourselves that it won’t happen or we ruminate endlessly in order to tease out every single detail of the imagined scenario and account for each contingency. And that rang true to me. Because every time I feel anxious or depressed, it’s so unsettling that I’m like, “I need to feel better immediately!” and then I do one or more things that sometimes makes me happy. And if it does make me happy, then it’s only for a second. And if it doesn’t make me happy, then I feel even worse than before. And I’m not talking about drinking or binge-eating or watching mindless television. Writing and reading are the two things in my life that are the least guilty of pleasures. But I think that sometimes writing and reading can be the wrong thing to do. When I am writing out of anxiety and out of a compulsive desire to chase the high that accompanies creation, then that doesn’t feel good and that’s not a good use of my time or inspiration. And some of my most hopeless and desperate times have been the hours I’ve spent picking up and putting down books and sifting through them relentlessly in order to find the one book that maybe might make me feel better. Watts’ book is about avoiding these easy fall-backs and attempting, in some way, to make peace with your insecurity. And just being able to accept that is, somehow, enough.